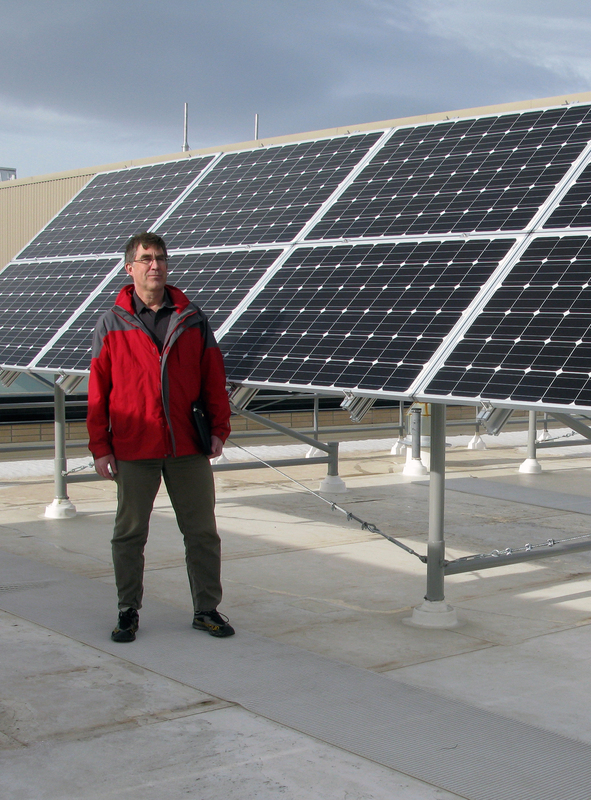 A solar array atop the University of Wyoming’s Energy Innovation Center is offsetting some of the building’s electricity costs. The 10.8-kilowatt solar photovoltaic array produced about 300 kilowatt-hours of energy in the first week of December, says Geology Professor Carrick Eggleston, associate director of the Center for Photoconversion and Catalysis (CPAC) in the School of Energy Resources (SER). “Part of the system, 2.4 kilowatts, is dedicated to research uses, including a current project in which hydrogen will be generated using a solar-powered electrolyzer and then combined with syngas from coal to produce methanol,” Eggleston says. The result is a higher value product and fewer greenhouse gas emissions from coal utilization. The project was funded by the CPAC and the SER. CPAC researchers seek less expensive ways to use not only solar energy, but also conventional and alternative fuels via improved catalysis. The center promotes and supports photoconversion and catalysis research, and educational opportunities involving renewable energy. CPAC faculty provide information for the public and for public officials regarding solar energy, fuel conversion and fuel cell technologies.